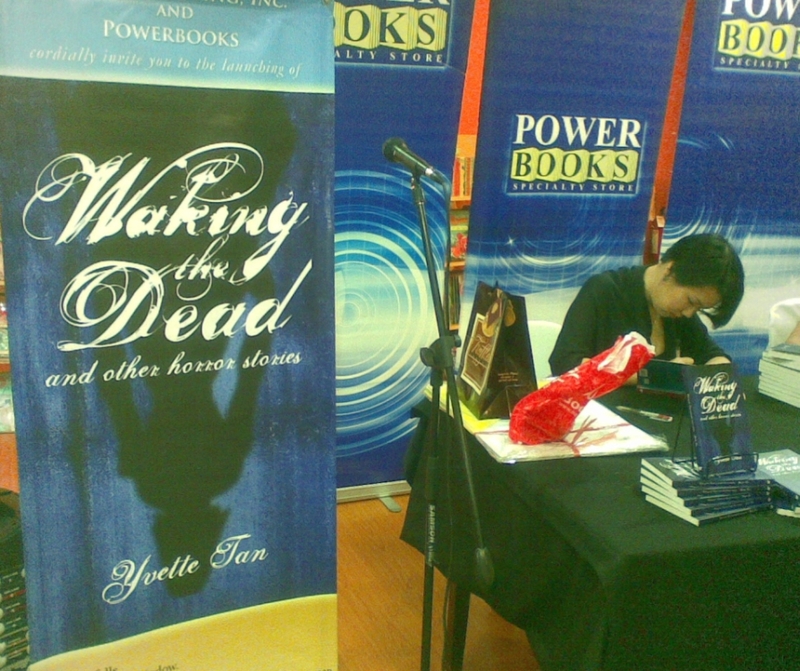 Anvil Publishing launched “Waking the Dead and Other Horror Stories” by Yvette Tan yesterday August 15 at Powerbooks, SM Megamall. Yvette Tan is an Avalon.ph client of more than 8 years patronizing books and Moleskine notebooks. Through the years she’s not just a regular customer but someone whom I considered a friend. Ms. Yvette Tan took some time to answer three questions we submitted. Avalon.ph: What kind of experience awaits those who will read “Waking the Dead and Other Horror Stories”? Yvette: I think they’re in for a lot of weirdness. The weirdest thing being that the stories in the book aren’t strictly horror. I’d like to think that they’re more stories about when reality goes a bit awry. I guess it;s because I never really set out to write what people call ‘horror.’ I got stuck with the label when people started coming up and saying my stories kept me up at night (my mom was not so lucky. She got people coming up to her asking why her weird daughter wrote such nasty stories). So what to expect from Waking the Dead? Expect a Philippines that is familiar yet totally different from the one we live in. Avalon.ph: Which story in “Waking the Dead and Other Horror Stories” had the most changes from idea to draft to final print and why? Yvette: You should have seen the last draft I submitted to the publishers! Half of it was marked in red. I took out a lot of stuff, tightened the stories, so that what you have now is a faster, better read. I like the idea of my stories being easy to read. I mean, I like books that are easy to read, so why should the things I write be any different? I think the tight edit has worked – people have told me (or each other, mostly on Twitter) that the stories they’ve read so far have bothered them, kept them up at night, and made them google certain bridges. One is a TV executive, one is a musician and one works in a men’s magazine. So it’s really a book for everyone. Avalon.ph: Let’s face it, a lot of readers were introduced to reading books or fiction through Harry Potter, The Da Vinci Code or the Twilight series. Why do you think they should pick up “Waking the Dead and Other Horror Stories” as their next read? For a review of Waking the Dead and Other Horror Stories check out the Inquirer.net link. You can also check out Yvette Tan’s blog on Adventures in TV Land: the misadventures of a media mercenary. You can follow her Twitter account: glossmania. Waking the Dead and Other Horror Stories by Yvette Tan, signed by the author, is also available on Avalon.ph for Php285.00.